Free Prescription Drug Coupons! Download your FREE discount coupon(s) below to save money on Non-Covered medication at pharmacies across the country. These coupons are pre-activated and can be used immediately to save up to 90% on your prescription drugs. Quit smoking now! 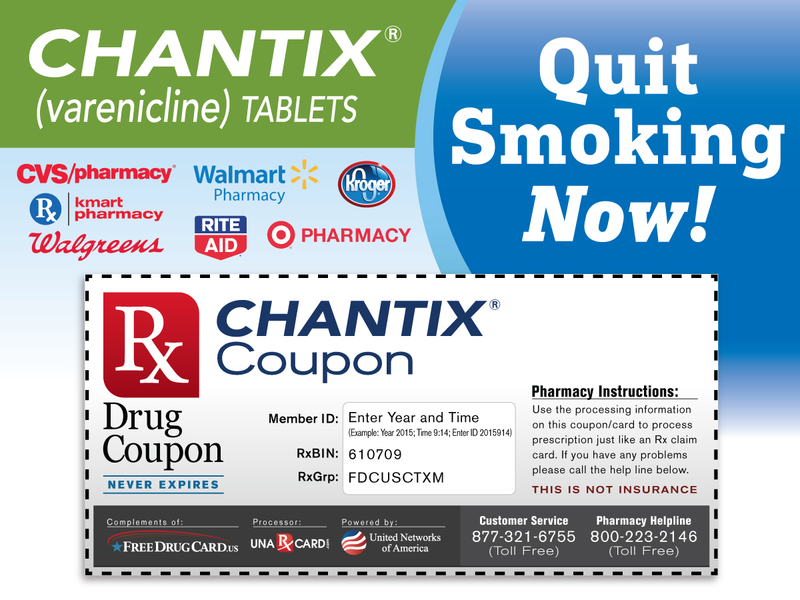 Print this free Chantix Coupon and get significant discounts on your next prescription! What drugs are not covered under most insurance plans and prescription drug programs? Infertility medications when used for assisted reproduction. Drugs prescribed, dispensed, or intended for use while in a hospital, skilled nursing facility or alternate facility. Drug products for any condition, injury, sickness or mental illness arising out of, or in the course of, employment for which benefits are available under any workers' compensation or other similar laws. Drugs administered at a doctor's office or hospital, including allergy serum, immunizations, biological sera, blood, or blood plasma. However, these may be covered under the medical plan. OTC products that do not require a prescription or any prescription medication that is available as an OTC medication. Exceptions are insulin and niacin. Drugs used for investigational purposes or experimental indications, drugs with no approved FDA indications. Injectable drugs, except when the drug can be self-administered, as defined by the plan. Other injectables may be covered under the medical plan. Unit dose or convenience packaging of prescription drug products. Durable medical equipment, prescribed and non-prescribed outpatient supplies, other than selected diabetic supplies. Drugs used for cosmetic purposes or aesthetic enhancement. Most health plans have a formulary list of prescription drugs, both generic and brand name that are covered through your health plan. Your health plan may only pay for medications that are on the formulary. Medication not found on these lists are considered non-covered drugs. Below are links to the drug formularies from some of the major health providers.